Compatible with the Windows version. 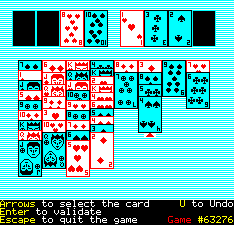 Load the game normally using CLOAD""
First appears a short intro, then comes the game selection screen. If you press Enter it will then use this number as the game number. If instead of pressing Enter you start typing a number, it will accept this value instead. Press Enter when you are done or Escape to switch back to the randomized mode. 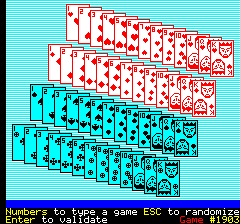 Please note that this number can be used in the Windows version of FreeCell, this will give you the same card distribution. 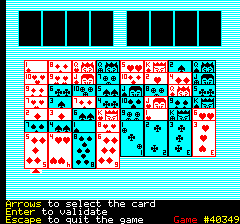 When you have selected the game, you can then play by selecting the cards with the arrow keys (it will skip over illegal moves), Enter to select the card, arrows to move the card, and Enter again to validate the choice. If you think you did a mistake,just use the 'U' key to Undo the move. If you think that undoing was a bad idea just use the 'R' key to Redo the move. You can Undo as many time as you want. If you do not own an Oric, which is very probable considering the only ones I know in the USA are in Arkansans and the other in Kentucky, then I fear you will have to use an Emulator. Just download Oricutron and start it. There are pre-built binaries for Aros, Haiku, Morphos, OS4, OSX and Windows! If you are using something else (Linux), then you will have to build it yourself. Why is it called 2.5k when it's larger? The game is actually 2.5k large, it's actually even closer from 2k than 2.5k. The final executable happens to be 3k because I had to add an intro. Because Defence Force lost a member this month. Bonus: Plus it will annoy people on Pouet that love to discuss if a 160 bytes Atari production can fit in the 128 bytes long category. 2013 was supposed to be a cool year, a year of celebration for the 30years of this good old Oric computer. It turned out to be the year of our biggest loss. 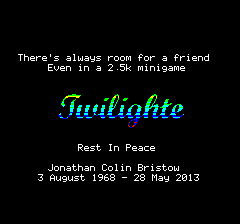 Twilighte, aka Jonathan Bristow, was by far the most dedicated Orician ever. By himself has released more games, demos and tools than anyone else. He probably actually did more Oric stuff than all other Oric persons together (or close). Twilighte gave us Zip'n Zap, Magnetix, Pulsoids, Sound Tracker, ODelight, Impossible Mission, Stormlord, Hide, and was busy working on Times of Lore, SWIV, OType, Wurlde, Cybernood and probably half a dozen other projects he did not have the time to complete. Some of you have probably met him at the Assembly, Alternative Party, SOTA, VIP or even the LCP parties. Some of you may have had a drink after a CEO meeting, or had some good time in a pub in his native England. He has been fighting a rare form of skin disease for the good part of the last decade, and finally passed away the 28th of May 2013. 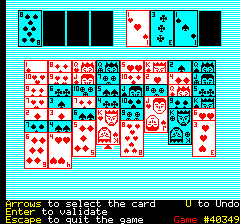 I was busy at the time preparing this Oric minigame for the @Party, so I decided to give an homage in this game. The "funny" thing, is that I'm releasing this to an American party, which I believe he never had any contact with, so probably most of you have never ever heard of the Oric name in first place. Well, that's life I guess.